Will write a letter this P.M. Arrived in Detroit yesterday at 4:00PM, and left for Buffalo via “Eastern States” Steamer on which I am at work at 5. Was lucky. Am well – found two old school friends on same boat. My grandfather had gone from Indianapolis to Detroit to get a summer job as a waiter on one of the steamers that went between Detroit and Indianapolis. 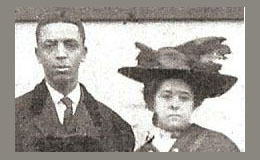 He was successful and had even found several friends who were medical students at other schools who would also be working on the steamer with him. It was a good way to earn money for school. Some worked as porters or waiters on passenger trains. 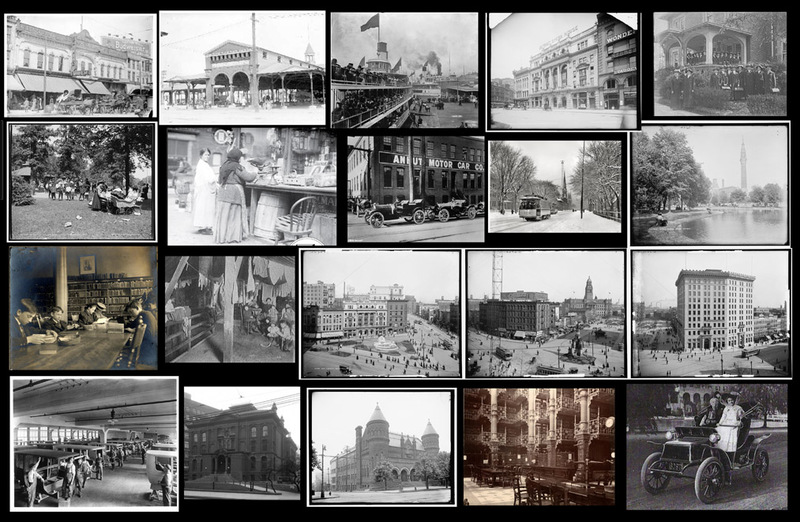 In 1910, just a year later, Detroit’s population reached 465,766. 5,741 (1.2%) were African American. Cass Technical High School graduated it’s first class of 6 students. Other high schools were Central (located in what is now Old Main on the campus of Wayne State University), Eastern and Western. This would have been the Detroit my grandfather saw as he spent his free time walking around Detroit. Click to enlarge. Click to see more sepia saturday offerings. Sounds like the sort of city one might like to use a time machine to visit in this era. Love the old photos. Indeed it does. I’m sure it wasn’t all big houses, new factories and museums being built. Superb collage. Kristin for Sepia Saturday as well. Great idea because I wasn’t going to do one this week. Thanks! I love the idea of going from Detroit to Buffalo by steamer. I guess it wasn’t yet Motor City in 1909, even if Ford had arrived there! And now, from 1.2 percent, Detroit ranks highest in the country for the percentage of African Americans in the city at 84.3 percent (Wikipedia). What a change! Looking at photographs of the steamers, they were very posh. The Paris of the West? How things have changed for Detroit! That’s very unfortunate. Very depressing for one who grew up there. The same thing has happened to San Bernardino, which is a city near where live, and is sometimes referred to as the Detroit of Southern California. There are still some beautiful old buildings, but the poor city has been economic decline for decades. Fabulous pictures. I am so into genealogy research and was just updating some of my files yesterday. Want to write a collection of fiction short stories to cover the different countries of ancestors. The post card you show must have been an exciting find for you. Gail, my Aunt found a whole packet of letters and postcards that cover several years and my grandparents courtship. My cousin scanned all of them and so I now have copies too. Love it! Neat that your A-Z Challenge post fit right into the Sepia prompt with all the cars on the dock. Did you plan it that way, or realize suddenly it could go both ways? Either way, I really enjoyed the collage of old photos. I didn’t even think of it until Bob Scotney mentioned it would work! Detroit must have been a magnet for many at that time. My grandfather’s best friend from the Great War started out in Detroit, after emigrating from Scotland, before moving to Canada. Both sets of grandparents moved to Detroit during and after WW 1. The plants were booming then and the population exploding. This is a fascinating history and genealogy blog. I have done some genealogical research on my family, but never blogged about it. Maybe one day in the future. I have found lost cousins and learned so much more while looking for information to round out posts. I highly recommend it. Clever you combining SS and AtoZ. Thanks to Bob for suggesting it! I was going to let Sepia Saturday slide this week. So many visits to do!! Detroit must have been a lot nicer back then. It wouldn’t be referred to as “Paris of the West” now! How wonderful to have that postcard and all the other family documents your aunt unearthed. It is finds like that that make family history such an absorbing hobby. You’re right. And something new is always turning up. I can read that postcard quite comfortably but I wonder how long it will be before the current schoolies grow up and can’t interpret cursive writing. Love your header photo. I wonder what the occasion was. Several of my grandchildren went out of their way to learn cursive but not all of them. American geography takes a different perspective when you take away air travel and places like Detroit and Buffalo are only connected by ship, rail, and two lane roads. 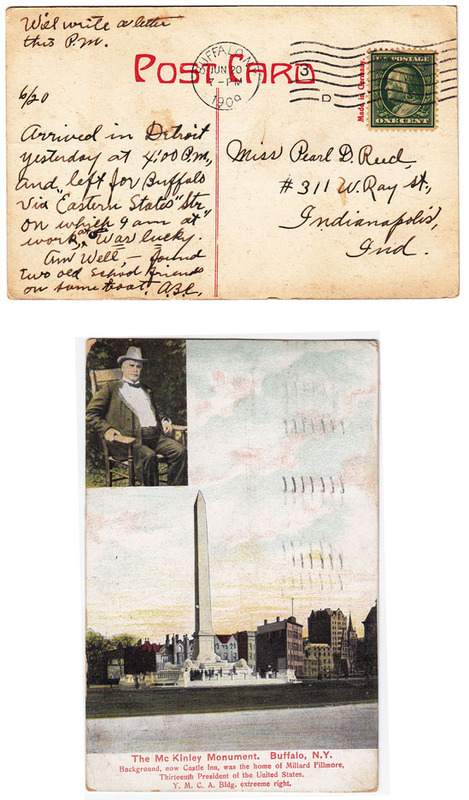 I wonder if the postcard of Buffalo’s McKinley Monument has a special significance for your grandfather. 1909 was only 8 years after McKinley’s assassination in Buffalo, and the obelisk was finished in 1907 so it was still new. McKinley was the third President after Lincoln and Garfield to be murdered so a postcard like this wasn’t a typical tourist viewpoint. He spent the summer traveling between Buffalo and Detroit so quite a few of the postcards have monuments and other local points of interest. I think if he’d had anything special to say about McKinley, he’d have written a few words about him. But, who knows? I have traveled only by train or car for the last 20 years and I agree, it’s very different than flying. You actually see what the land looks like and appreciate the differences and the distances. It gives you time to get from one place to another mentally as well as physically. I never knew that about Detroit being compared to Paris. The collage was really interesting and full of such detailed pictures. I never knew that before either. What an interesting little window to the past more than 100 years ago. Thanks! Enjoyed it! Very interesting to learn about the past glory days of Detroit. I must admit I had to look closely to see the port photo in the collage. D could also have been for danger, of course. I just can’t even imagine of all the things he is seeing? So glad you are sharing this with us. The History alone is a lesson. Just his postcards are a book in itself. I’m reminded of when we would travel I would buy them just for the scenery. These are Great! I do that too! I have lots of postcards that were never sent because I like the photos and they remind me of trips I made.